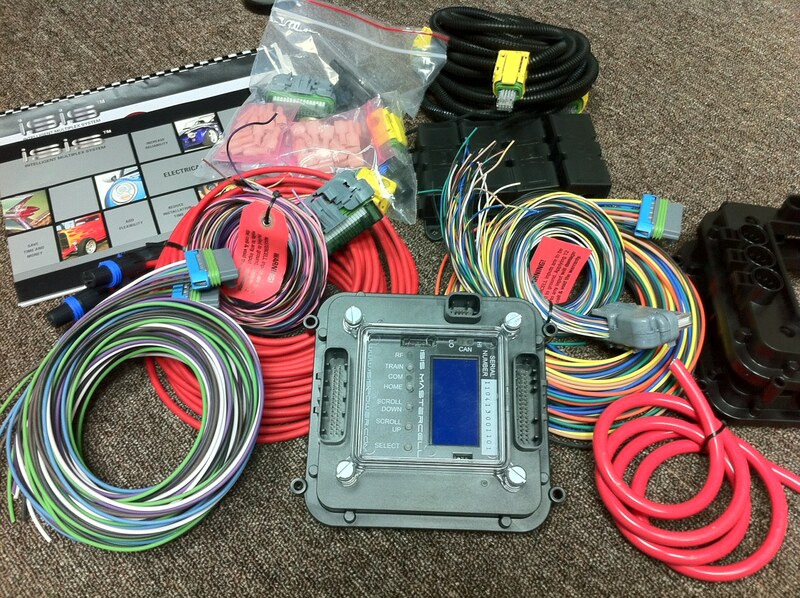 We will be using the ISIS Intelligent Multiplex System to Re-harness our 89 Fox and this system will interface with the Ford Racing Control Pak easily. Push To Start in an early Fox. Now how cool is that. Stay tuned for details! It’s go time. Stay updated the next 7 days as we get BTC up and running. We are on the home stretch! BTC Update – Running Soon? We plan to have her up and running next week. How many more in pieces do you think we can get!? We just posted a Blog over at StangNet with our latest updates and this months plans… be sure to check it out! Built to Cruise is coming along. All the exterior trim has been completed… all new parts; accept for one rear quarter driver side window, as you can no longer get the Carlite rear quarter windows. The used one we picked up is almost new, thank goodness. Every exterior piece of BTC has been replaced with all new parts, giving our Fox restoration a very clean and new look. We have completed our fuel setup for the 5.0 swap, all we need to do is connect the fuel lines to the pressure regulator and to the engine fuel rail, but this will happen once we do a final bolt in of the engine. Currently we have no plans to boost or heavily modify the new 2011 5.0 engine and because of that we were able to retain the stock fuel lines that run from the fuel tank up to the engine bay. We obtained a new OEM style fuel tank (our old one leaked) from Late Model Restoration. We also replaced the fuel level sending unit and we chose the HighFlow Performance 255Lph intank fuel pump (part # HFP-340). This should be enough fuel flow for our setup and allows us to keep the in-tank setup and we were not forced to mount an external pump. We also replaced our fuel filter while we were at it. The new 5.0 engine is not a fuel return style engine and Ford Racing configured the Control Pak they offer to work with a return type system (keeps the programming and configurations simpler). To handle the fuels return, we chose the Professional Products Fuel Regulator (part # PP-10671) which is setup for an EFI system and has a return line fitting built into the regulator. 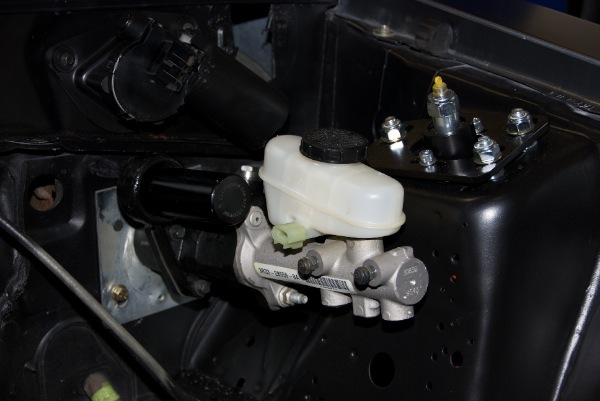 We modified the stock lines to connect to the fuel regulator with various fittings and we also picked up a Dorman 3/8″ Quick Connector, which will allow us to connect to the factory fitting on the fuel rail using EFI fuel hose. 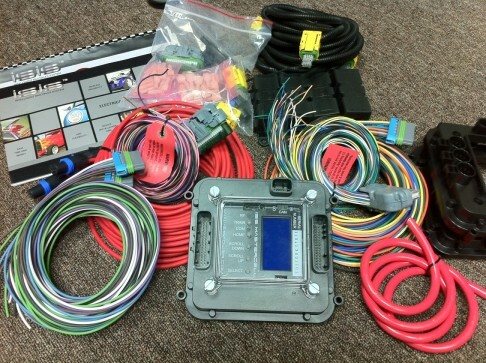 You can pick one of these up at any parts house (part # 800-055). 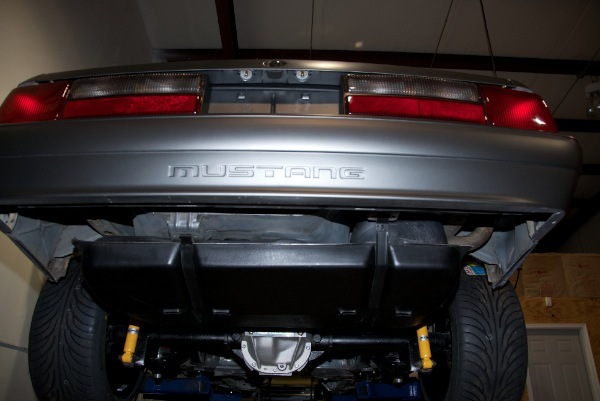 With this new 5.0 and like any other modular engine being swapped in to an early FOX Mustang requires more room. One of the things in the way is the old vacuum type booster in the Fox. It takes up to much room so it has to go. We want power brakes and plan to run power steering so we obtained a factory mustang hydra hoost setup that you can find in the SN95 cars. To mount this booster required removing the alignment stud and elongated the top left bolt hole in the firewall to the right about ¼”. We also raised the diameter of the main hole through the firewall to give more clearance for the snout and boot on the booster. 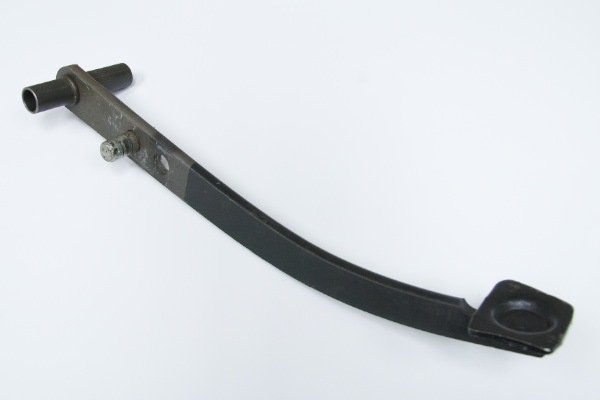 To get the new boosters brake rod to mate with our stock brake pedal, we removed the pedal from the car and moved the connecting pin up 1” (center on center). To do this, we ground off the weld holding the pin in place, knocked it out and drilled a new hole, hammered in the rod and welded the back side in place. Now we have a stock fox brake pedal that will work with an SN95 booster and we didn’t have to do what some do and cut off the rod from the old vacuum booster and weld in back to the new booster. Removing this pedal is not for the weak of heart. Our dash was out so it made it much easier for us. 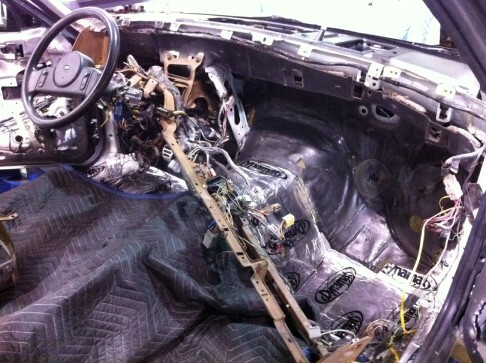 The engine bay is now ready to accept the new 5.0 engine. We will be running the plumbing for the new brakes soon so stay tuned for that. This should make for a killer handling in BTC but also give us daily driver type comfort and stability. We are in contact with KRC Power Steering who is working with Ford Racing to supply anyone who is doing a 5.0 conversion with a power steering pump solution. 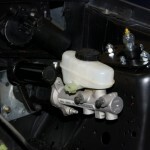 The new 2011 Mustangs have electric power steering so there is no factory pump solution. KRC is designing a bracket to accept their all new KRC Revolution power steering pump and locate it so as to keep the stock A/C and Alternator positions. 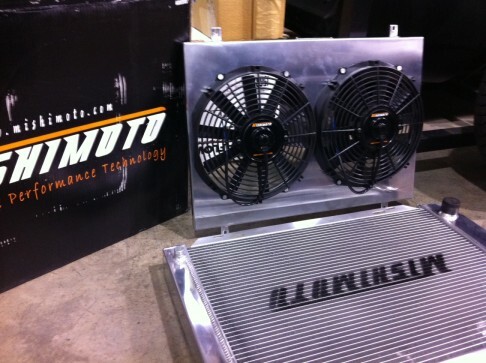 This will be a great solution for everyone doing a 5.0 swap in to any vehicle. 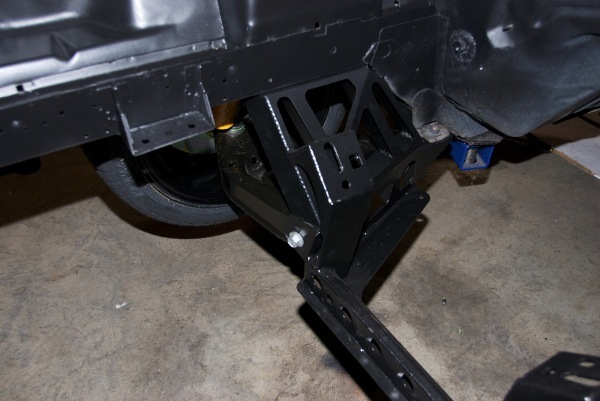 This setup will power the FOX power steering rack and the new Hydra Booster we installed. We expect to have this new setup not long from now. We are currently waiting on BBK to send us their newly designed headers exclusively for the 2011 5.0 swap into FOX Body Mustangs (79-04). 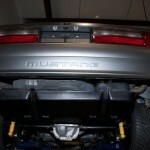 These are long tube headers with full 1 ¾” primaries like the factory headers. 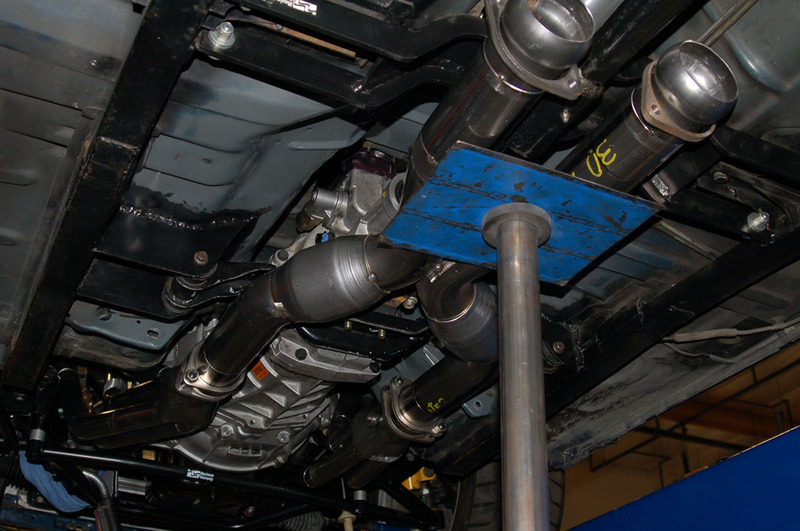 They are also building newly designed X pipes with or without cats to mate up to their new 5.0 headers. They are 3” in design but the ball connection on the exit end will be 2.5” to mount to all popular 2.5” catbacks. 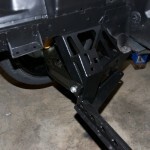 We expect to be bolting these in place and starting the wiring of the new engine about the middle of February. 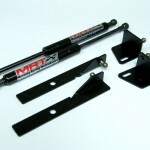 Another cool new part we will be installing is Mustang Racing Technologies new early FOX hood struts. These will allow us to show off the new engine by popping the hood and raising it up smooth and staying in place without have to clank around with the factory prop rod. Finally a solution for us our SN95 buddies have had for years. BTC Update: It’s all in the details.. and Time. Just wanted to make a quick update for those following along… I am sure some of you are wondering what is going on with the project and why the delay in updates. Mostly there has been a lot of background things going on. When we set out on the project we did not want to pull off a ‘one off’ restoration and swap. We wanted people to follow along with what we had done and feel confident that you guys could source the parts and do the swaps/restorations yourself. That is where we are, and we are glad to say that those hurdles have pretty much been cleared, but it does extend the build finish time until about the middle of February. BBK has finished engineering some long tube headers and X-pipes for FOX swap. Expect to have these in our hand in early February and not sure when they will be available at the dealer level, probably late March. 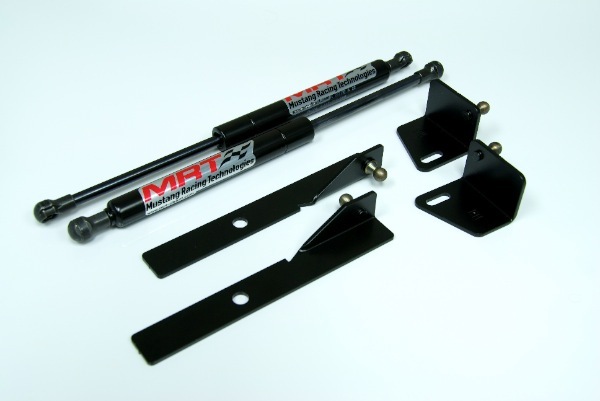 Cold Air Kit – Currently the ones we have found on the market that are specific for the 2011 models turn the bend out of the throttle body to late and are hitting the FOX radiator. BBK is going to look at making their 5.0 CAI fit the FOX swaps and their setup will allow you not to have to tune the PCM. Also you could bend your own 3.5″ tubing but be known that at the MAF you need to make sure you are measuring at 3.5″ diameter and you should be OK. Also look at a smaller cone filter at the end like a GT500 filter, we are hearing reports than larger conical filters are actually causing power to be lost. Power Steering Bracket – Ford Racing has a bracket in production and should be out soon, this will allow use of 2005 Mustang components. So you will need to source those. They hope to in the future come up with a bracket that will allow the use of BOTH A/C and P/S. 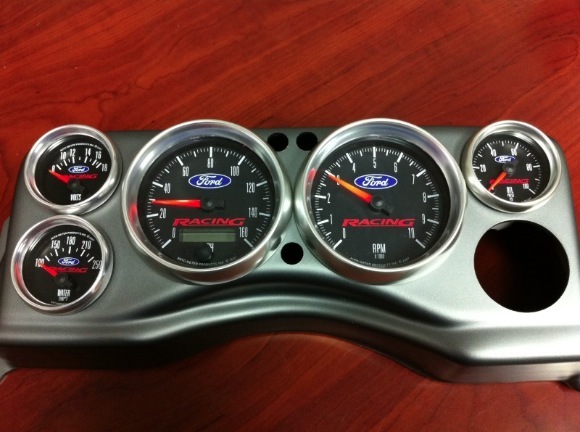 We got word that the early FOX front sway bars are hitting the Alternator on the new 5.0 engine. We believe and so does High Flow Fuel who are doing their own 5.0 swap, that a late model SN95 sway bar and hangers will do the trick. We should have our final version of the J&M K-member in early next week… once we get that here we will start the install of the front suspension, brake system and fuel system, stay tuned for those updates soon… this will help us move forward on our project and something for you guys to nibble on while we wait for the BBK headers. 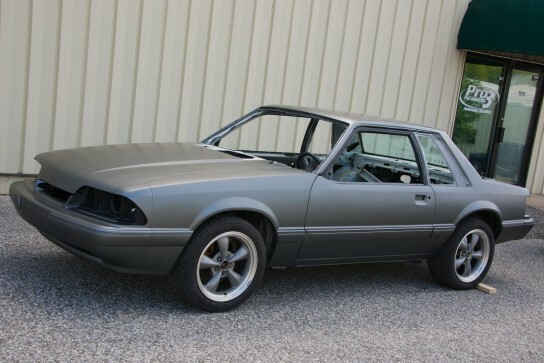 As part of the Built to Cruise project, restoration of the FOX body has always been part of the plan. We have had the Mustang back from paint for about 3 weeks. We are still waiting on some more engine parts before moving on to the drive-train, so we started on other parts of the Mustang. After some SEMS black trim paint being applied back to the door and jam area where it was originally applied, we started to put the door and exterior trim back on the car. This is an update and details of the parts used. Cleaning up and/or replacing the trim area around the door makes a big difference on these cars. Take a peek at the images and parts listed for reference. 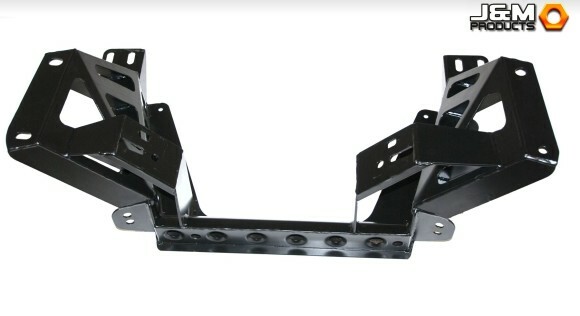 We sourced these parts from Late Model Restoration and CJ Pony Parts. The new mirrors come in a shiny new smooth black. Of all the new parts, these are the only ones that needed to be painted to match the trim black look that is on the Mustang. After we taped up the mirror glass, we cleaned the mirror bodies with some Dupont Prepsol which removes any contaminants. Then we applied some Klean-Strip Bulldog Adhesion Promoter. Then we sprayed them with the SEMS black trim paint. They look great! The run channel liners are the felt strips that run around the frame of the door and down in to the track for the window. Removing the glass seemed to be the only way to replace these, we could be wrong?. Since we sent the car to paint, we had already removed them. Installing this piece makes a huge difference as the felt is soft and pliable again, and the exterior rubber part is new and clean. Having some aluminum rivets on hand are necessary to replace the outside belt strips but replacing them are well worth the effort. 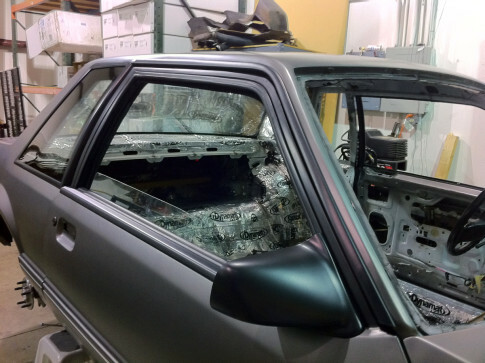 Rear coupe quarter windows. 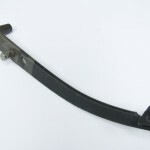 We were able to get one new for the passenger side from CJ Pony Parts, but it looks like Carlite who makes these will not repair the tools that make these parts, so sourcing new windows looks to be impossible now. That is a shame for sure. We are currently looking for a clean driver side to repair to a ‘new’ look. All and all this part of the restoration was not that difficult, but does require some patience and skill. 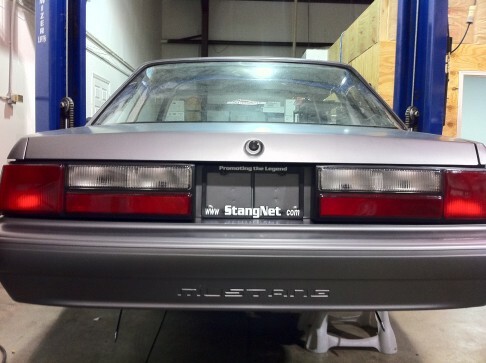 We got some new Fox LX tailights from Late Model Restoration and installed them today. I know a lot of people like the GT tail lights, but I am not a fan. These lenses new out of the box have a good bit of the lens trim molding in a Fox grey. I assume this was a factory color and they all came this way? I wanted these to be black all the way around so I taped off the lenses, cleaned them up with some Dupont Presol and painted them nice and pretty with some SEMS Trim Black. After installing them I noticed on the passenger side that the outside edge that matches up with the rear quarter seemed to be too far inward exposing some of the seam molding where they taillight would normally cover up. I don’t think this was because of the lens itself, but one of those ‘tolerance’ things from the factory. To fix this, I took a die grinder with a drill cutting bit and lengthened the holes (6 of them) to the right, allowing the lens to shift outboard. This worked like a charm. Now the true paint/body line is matching up with the lens perfect. Also of note, when you install a set of these, be sure to get your up and down height correct. 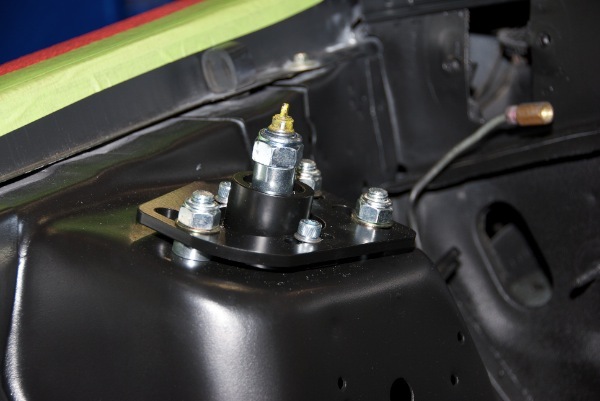 You do not want them resting on the bumper cover, they should be some were around 1/4″ above the bumper, and use your deck lid line to make sure you are parallel all the way across. Also for those following along, we got in the radiator hoses today. We ordered from Tousley Ford some stock 2011 5.0 hoses, these will work fine, the bends match up perfect to our Mishimoto radiator. Only thing is that the upper hose is 1 1/2″ and the radiator upper inlet is 1 1/4″. 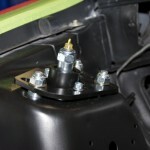 Jonathan over at Late Model said just use a nice screw type clamp and it will seal up just fine. They run it this way over there at Late Model on many of there mod swaps they have in house. fitting pushrod mounts as well for the setup. less material if you were to compare to tubing metal content. will get an official weight soon. She is back at StangNet headquarters. Tomorrow we start test fitting some parts. Stay tuned!